We love the look of burlap this holiday season. 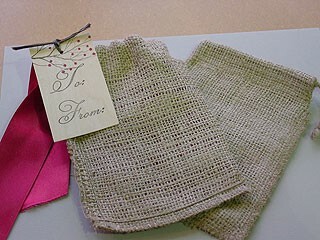 Use these burlap bags for small gift pouches that can be reused after the holidays instead of being thrown away like most wrapping paper is. We're also finding other uses too - they make the perfect presentation for a gift of coffee or hot chocolate and we've made darling stationary pouches with them too. Two sizes are available. The small is 4 1/4 inches x 6 inches and the large are 6 1/4 inch x 10 1/2 inch. Each sack has a jute string - we often take that out and insert a beautiful satin ribbon.